You bring your dancer(s) once or twice (or more) every week; when you pick them up, they’re a little sweaty and needs a snack. You wash the dance gear and keep track of the shoes, and smile at the other parents who are doing the same. You peek through the windows and doors during class, you spy your child practicing dance moves in the living room. And at the end of the year, you gather the dance costumes and the family, and head to the dance recital. Getting out of the car at the dance recital, your dancer’s sibling cries, “Why do they even have recitals? Why do we have to go?” And here’s your answer. A recital offers a culminating event, a chance to say, “Hey, Mom, watch this,” as your child proudly shows a new skill that has been eight or nine months in the making. The costumes, photos, and videos of the event become archives of your dancer’s childhood, memories of that time they worked so hard to achieve something incredible. 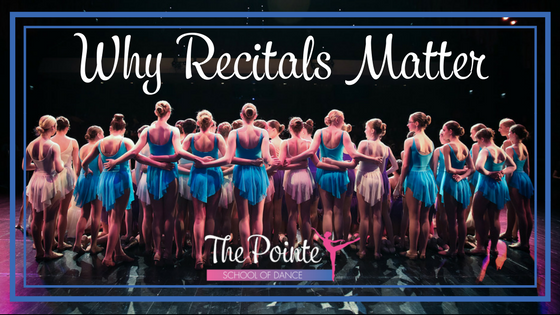 Performing in a recital builds confidence in your dancer as they showcase their hard-won skills in front of an audience, all lights shining and eyes on the stage. The applause at the end is the reward for months of effort, and the dancers walk off the stage feeling satisfied with a job well done. Dance is a team sport. Dancers in a group routine must be constantly aware of the other dancers, in tune with their movements. Working to prepare a routine takes investment from everyone in the group, and by the time the recital rolls around, these dancers have learned the true meaning of teamwork. Through preparing for a dance recital, students learn what it means to be needed on a team, to have the success of the group depend on everyone’s continued best efforts. Even the youngest dancers learn through dance classes that nobody will perfect a routine or new step the first time—or the second, or the fifth. These dancers have built technique upon technique, skill upon skill in order to present their very best selves to the audience at their recital. They’ve had to listen, to focus, to make mistakes, and to get back up again when they fall. During those months of dance class, students learn so much more than a few cool moves. They learn to communicate, to be patient with others and themselves, to appreciate their bodies, and to be accountable for their learning. A dance recital brings all those elements together at one time, on one stage, and your dancers have the opportunity to experience the positive outcome of all their hard work. That’s something to celebrate. So… is it worth it? You bet it is.